The history of Kwanzaa, a non-religious celebration of culture and family in African-American households, emerges from centuries-old traditions and more modern struggles. Dr. Maulana Karenga created Kwanzaa in 1966. He was greatly influenced by the Civil Rights struggles of the decade, but the most direct impetus for creating the holiday was the Watts Riots of 1965. Karenga drew on traditional African first-harvest celebrations to plan an event that would bring families together while helping them learn more about their roots, so they could better appreciate their place in the larger African cultural community. The name Kwanzaa comes from the Swahili phrase matunda ya kwanza, meaning "first fruits", a reference to the original harvest celebrations. Swahili was chosen in naming the holiday and many of its elements because it is widely spoken in Africa, crossing national borders, perfect for an observance that aimed to celebrate Pan-Africanism. In the decades since its creation, Kwanzaa has gained widespread recognition as a cultural celebration. From Kwanzaa-themed episodes of television shows to a 2008 documentary film, The Black Candle, the media has certainly helped increase awareness. However, the most powerful method of spreading the word has been the millions of people who celebrate the holiday each year. Throughout the history of Kwanzaa, the holiday has focused on several distinct elements that reflect its cultural underpinnings. 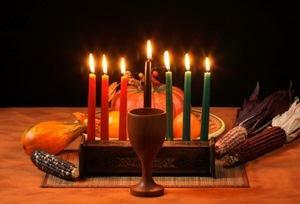 Kwanzaa takes place for seven days during the holiday season, from December 26 to January 1. The founder of the holiday chose the principles because he felt they were essential elements of African culture that could be used to strengthen the African-American community. These symbols are typically combined in a display where they can be appreciated throughout the celebration. Some families also include a Pan-African flag and a poster of the Seven Principles. They are also placed in a central location so the family can gather to light the candles from December 26 to January 1. The black candle represents the African people and corresponds to the principle of Unity. The red candles represent struggle, with candles devoted to Self-Determination, Cooperative Economics, and Creativity. The green candles represent the earth along with Purpose, Collective Work and Responsibility, and Faith. The black candle is placed in the center of the Kinara, with the red candles to the left and the green candles to the right. On December 26, families light the black candle. On each following night, one additional candle is lit as the family reflects on the meaning of a specific principle. The holiday culminates in the Kwanzaa Feast, or Karamu. The Seven Symbols are a centerpiece of this celebration. As a comparatively new holiday, Kwanzaa offers a unique African-infused celebration. With increasing efforts to make people of all cultures welcome at the Kwanzaa table, it looks to enjoy continued growth in the decades to come.